ANOTHER TAD DRIVER MAKING THE LEAP? The word on the street suggests that a 2017 Top Alcohol Dragster winner will take his or her aspirations to the next level and license in a Top Fuel dragster following the NHRA Nationals in Norwalk, Ohio. Sources say the kid has the right tools for the trade. Read more about ANOTHER TAD DRIVER MAKING THE LEAP? Records are made to be broken, and apparently, from all indications, a three-decades-old mark fell from the proverbial record book recently. It just hasn't been officially noted. Leave it to us, the caretaker of those unsavory stats to declare Terry Earwood's record of shortest reign as a divisional director has been blown out of the water. RUMOR MILL - PROCK, NEFF RETURN TO FAMILIAR SURROUNDINGS AGAIN? No, they are not leaving John Force Racing. Word on the streets suggests Mike Neff and Jimmy Prock will trade places once again, returning to their original assignments. Neff, according to our sources, will be tuning the Funny Car driven by the 16-time chamion while Prock will pair up once again with Robert Hight. This should be the line-up, we are told, at next week's NHRA Gatornationals in Gainesville, Fla.
Read more about RUMOR MILL - PROCK, NEFF RETURN TO FAMILIAR SURROUNDINGS AGAIN? 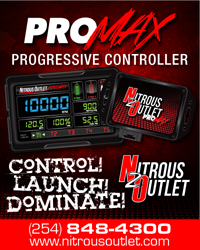 RUMOR MILL - NHRA SNIFFING AROUND THE DRAG RADIAL COMMUNITY? We've heard this from a reliable source, and to be honest, are not surprised. Apparently, the NHRA has already put its feelers out for Drag Radial participants to exhibit Drag Radial competition. If they are successful, don't be surprised if these cars make an appearance at the NHRA Southern Nationals at Atlanta Dragway in May. Read more about RUMOR MILL - NHRA SNIFFING AROUND THE DRAG RADIAL COMMUNITY? RUMOR MILL - IHRA LANDING MAJOR TELEVISION PACKAGE? This might have been the last thing CompetitionPlus.com readers were expecting following the ARP Question of the Week poll three weeks ago where the overwhelming majority voted the race series was finished. However, a reliable source tells us the IHRA is expected to announce a multi-year package with a major television partner as early at next week. Read more about RUMOR MILL - IHRA LANDING MAJOR TELEVISION PACKAGE? RUMOR MILL - LARRY MORGAN TO RACE IN PRO MOD? Anyone who knows Larry Morgan personally will attest while he is an excellent Pro Stock team owner/driver when given a good racing budget, he's always had a Pro Mod spirit. A couple of sources close to the situation tell us "Mr. Tell It Like It Is" will be back racing in the NHRA during the 2017 season, behind the wheel of a supercharged Pro Modified entry. Stay tuned, you're gonna love this once we can confirm the details. Read more about RUMOR MILL - LARRY MORGAN TO RACE IN PRO MOD? RUMOR MILL - NHRA DOING AWAY WITH FRIDAY TOP 12 FORMAT? This is one of those rumors we hope comes to pass. Apparently, over the last few seasons, the Top 12 qualifying format has hurt more teams than it helped and with this said, we hear the NHRA is planning to do away with the procedure for 2017. We know of a number of smaller budget teams this procedure affected over the last couple of seasons. Read more about RUMOR MILL - NHRA DOING AWAY WITH FRIDAY TOP 12 FORMAT? RUMOR MILL - DSR PARKING A DRAGSTER? Multiple sources have confirmed with CompetitionPlus.com but DSR isn't talking about banter suggesting that the dragster driven by Shawn Langdon has been parked. The word on the streets suggests the team hasn't been disbanded but is parked until adequate sponsorship is acquired to run the full tour. As official confirmation is given, we will provide details. Read more about RUMOR MILL - DSR PARKING A DRAGSTER? RUMOR MILL - A NEW SPONSOR FOR COURTNEY? Sources close to the situation tell CompetitionPlus.com that Friday's announcement at John Force Racing will reveal a new sponsor for Courtney Force's Funny Car. We are uncertain if this is a new sponsor in addition to Traxxas or a replacement. Read more about RUMOR MILL - A NEW SPONSOR FOR COURTNEY?